Rod Dinger, A.A.E. has extensive experience in the public sector. He was most recently the Support Services and Airport Director for the City of Redding. As the Support Services Director, Rod had direct oversight of six internal City divisions that included Airports, Solid Waste, Information Technology, Fleet, Building Maintenance and Purchasing; a position he held between 2011 and 2015. The Support Services Department has an annual budget of over 30 million dollars and over 125 employees. He has overseen the City of Redding’s two airports; Redding Municipal and Benton Airpark since 1996. Rod came to the City of Redding in 1991 as the Airports Operations Manager. Prior to his arrival, he worked at the Long Beach Airport as the Noise Abatement Manager. Rod began his airport management career as an Operations Intern at the San Jose International Airport. He is a 1987 graduate of San Jose State University with a Bachelor of Science Degree in Aeronautics. Rod served in the United States Air Force from 1978 to 1982 and has been a pilot since 1976. Rod is an Accredited Airport Executive (AAE). 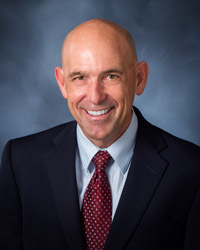 He is a past-president of the Southwest Chapter of the American Association of Airport Executives (SWAAAE) and has served as National Board Member for the American Association of Airport Executives and is also a Past-President of the California Airports Council. Rod is a very proud father and a grandfather. He grew up in rural Pennsylvania, but has spent most of his life in California very near his family. He is a sports fan and still plays competitive softball as well as squeezes in some golf from time to time. He enjoys reading history, frequenting museums and attending music concerts.